After another long Pittsburgh winter, spring is officially and finally here – and what do our thoughts turn to but beautiful gardens that are just beginning to bloom. 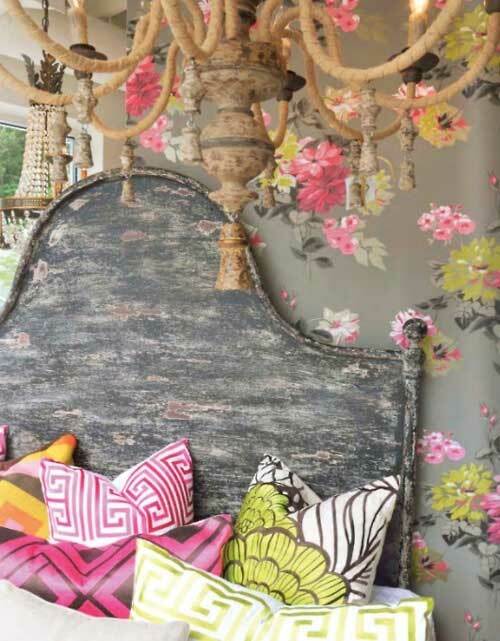 Gorgeous floral fabrics and wallpapers can transform any room into a delightfully fresh and lush garden. We love to balance florals with softened geometric patterns, stripes or solids for an eye appealing and sophisticated design. Mixing these patterns in a space will add interest, color, and depth. 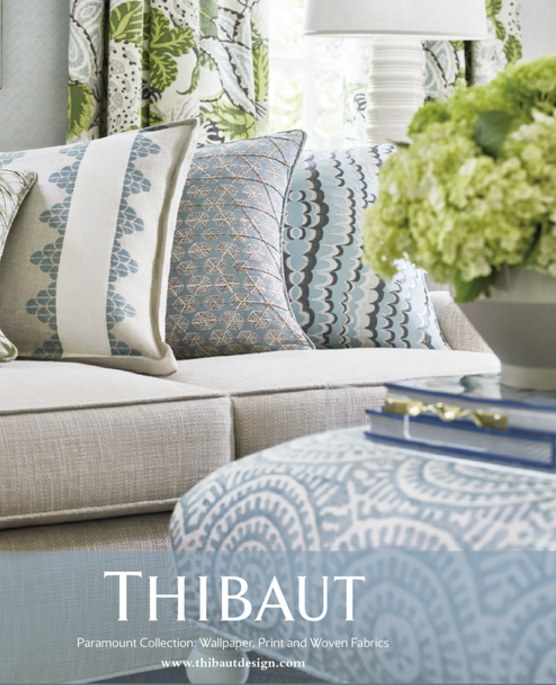 Even though the patterns don’t necessarily match each other, the scheme can work as long as they go together. The main thing to remember when mixing florals and other patterns is for them to complement each other and not compete. We always follow these guidelines so the room will not look jarring or uncoordinated. Odd numbers look best so using three different patterns in varying scales is a good way to begin. The largest pattern can be the anchor pattern with all of the colors in the selected palette. Then add a medium scale pattern with some of the colors and finally a small scale one with two or three of the colors. The intensity of the colors should be the same – for example, do not mix pastels with jewel tones. Also, it is always a good idea to break up the patterns with some solids or tone-on-tone fabrics. These pictures from www.tidbitsandtwine.com illustrate the importance of intensity as well as of scale. The fabrics in the picture of the headboard and pillows are in pastel colors with the floral being the largest scale with the most colors while the chevron and the geometric print are smaller scale and have one or two of the colors. The other picture shows a wallpaper background in a bold and bright print behind the bed. It is the large anchor pattern with a mix of smaller patterns in coordinating colors. These vignettes are all so lovely for spring. And, the best part will be when winter returns, your room will still speak spring to you. We have been following the Style Spotters who were at the recent fall market in Highpoint, North Carolina. They reported on new trends that they found to be redefining the shape of home fashion – it seems that what is old is new again in many cases. So, here are just two of their new product picks. Internationally renowned designer and forecasting expert Stacy Garcia focused on pieces that featured unexpected pairings of materials and finishes. 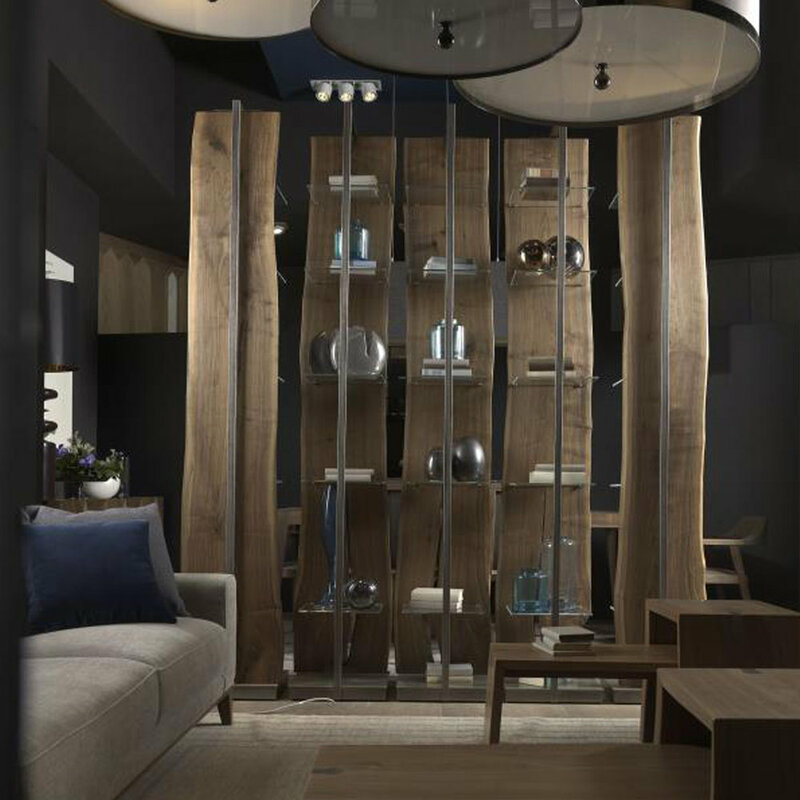 We particularly liked the contemporary, yet rustic Double-Sided Bookcase Room Divider by Artitalia Group which combined the natural elements of raw wood with a modern material of steel. We have always loved dark and dramatic walls, and they are definitely on-trend now. Deep, rich backgrounds lend an air of drama and sophistication to any room and give the space a strong identity and real sense of character. 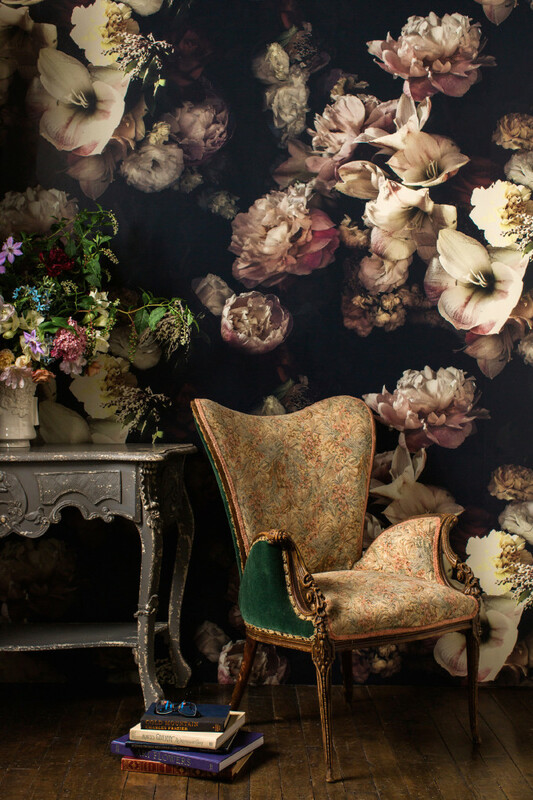 This is especially true of these moody florals which are reminiscent of still life paintings from Dutch Masters of the Golden Age. 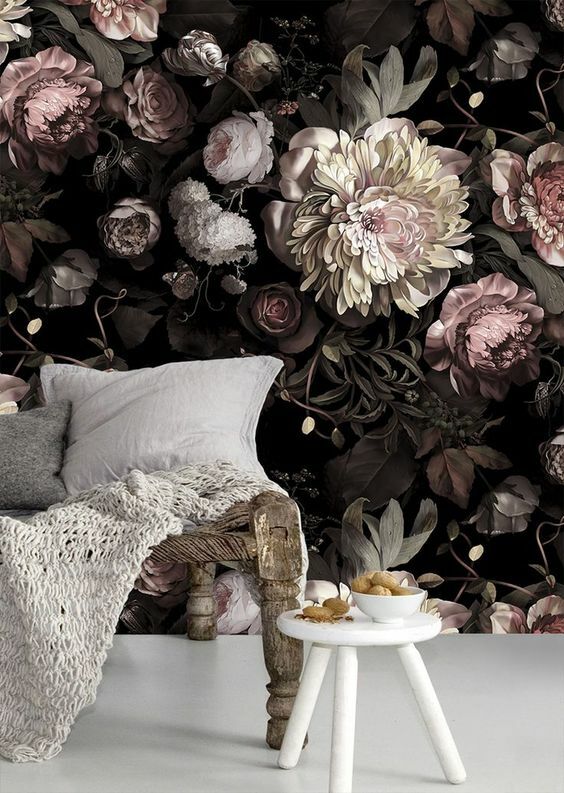 Oversized and printed on a background of decadently deep shades, these wallpapers are not for everyone, but they are truly beautiful. Somehow, they are traditional, yet modern and luxurious, and they are clearly not your grandmother’s wallpapers. They can make a major statement in a small powder room or can be used as an accent wall in a living room or behind a bed in the master bedroom. The Pantone Color Institute is a consulting service that forecasts global color trends. After numerous announcements from many paint companies, several weeks ago Pantone finally announced their eagerly anticipated choice for their Color of the Year 2018! They chose Ultra Violet, a super-bright purple which Leatrice Eiseman, the executive director of the Institute, says "communicates originality, ingenuity and visionary thinking." This year's color was not chosen because it is regal, though it does resemble a shade that has historically been considered to be majestic. As a color that can take you in so many directions, Ultra Violet makes a statement in any space, whether it’s one of tradition and elegance or unexpected boldness. While it is clearly dramatic and provocative, it is a difficult color with which to decorate, and there have been many diverse opinions expressed about this choice. Would we choose this color in our designs? It would certainly depend upon the client and how they feel about it. So, because it mixes well with grays, soft shades of green, and other neutrals, we would love to use it as an accent - perhaps, a soft mohair throw or a few pillows. Ultra Violet can be softened with other shades in the same family such as mauve or lilac. It could be pretty and feminine in a young girl's room when used in this way. What do you think of this shade? We would love to hear your opinion. But, just remember - no matter what our opinions may be, we will be seeing Ultra Violet everywhere in home design as well as in fashion this year. www.apartmenttherapy.com - This purple upholstered bed certainly does pop! www.housebeautiful.com - This living room has a lot of purple, but it is pretty and tasteful. www.the penneyhoarder - Touches of purple in this mostly white teen room is a conservative way to use this color. We have never seen so much shiplap as that featured on HGTV’s Fixer Upper with Chip and Joanna Gaines. Shiplap walls have been around for a long time, but we have noticed that many other designers have been using shiplap recently. So…. What exactly is shiplap? Traditional shiplap boards have a groove cut into the top and bottom allowing the pieces to fit together snugly. It has generally been used to construct rustic sheds or barns. Now, it has become popular for interiors as well. Horizontal shiplap on the walls is informal and homey, creating a warm and charming rustic look. In the older homes that Chip and Joanna renovate, they often find real shiplap underneath drywall, but, if they do not, they have been known to add some newly planed rough-hewn boards or repurpose boards they find in old barns. If you are still not sure exactly what shiplap is after looking at these pictures, just watch a few episodes of Fixer Upper and you will be. 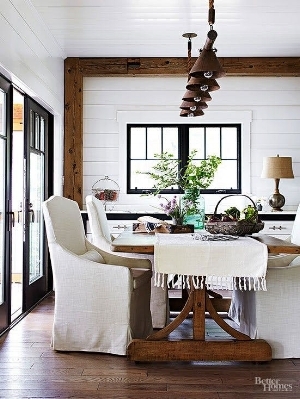 Better Homes and Gardens – This dining area has a clean and crisp “contemporary” rustic look. www.mountainviewcottage.net – For DIYers, this blogger shared exactly how they achieved a shiplap look in their daughter’s nursery. We love the juxtaposition of the rustic walls, quilt block art work, and the elegant crib and chandelier. www.scoutandnimbleblog.com - In this bedroom, the painted shiplap in a deep contrasting color, is a nice accent wall.